I did it! I actually wrote 50,000 words this year. 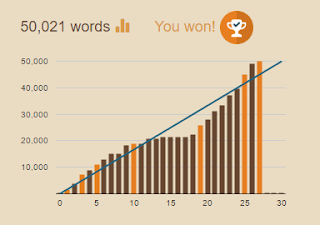 I've had my nanowrimo.org account for 5 years now. This is the first year I even attempted to start. So what made this year a success? I think that it was the fact that I was able to write non-linearly by using the Scrivener software. Getting the discount on the software was another big motivation. I like that I can do all of my planning in the program and that it makes it super easy to compile all of your work into an easily readable and shareable format. I'm really proud of myself for finishing. I can't wait to start working on making it more readable in December. I'm really excited to attempt to do NaNoWriMo this year. I've thought about it before, but never really had the motivation to do it. This year I have been thinking about it, but didn't do any planning leading up to it. Well today I actually met the word goal. I'm going to attempt to tack a few more onto it so I can be a bit ahead and have a cushion just in case I have some rough days. This is especially important to me since I have a demanding 3 year old to keep entertained while I am writing. 1700 words so far today. Fingers crossed I can keep it up.